Day Trip: Bike or Hike? 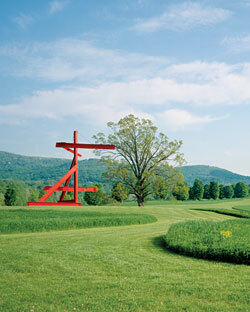 The gorgeous but tough-on-the-feet Storm King Art Center, an hour up I-87, just added rental bikes to help visitors zip from Maya Lin’s Wavefield to Zhang Huan’s newly installed Three Legged Buddha to Mark di Suvero’s Mother Peace (pictured). A fleet of ten seven-speed Electras, along with helmets and maps, are now available near the south parking area ($10/hour, $40/day; stormking.org).